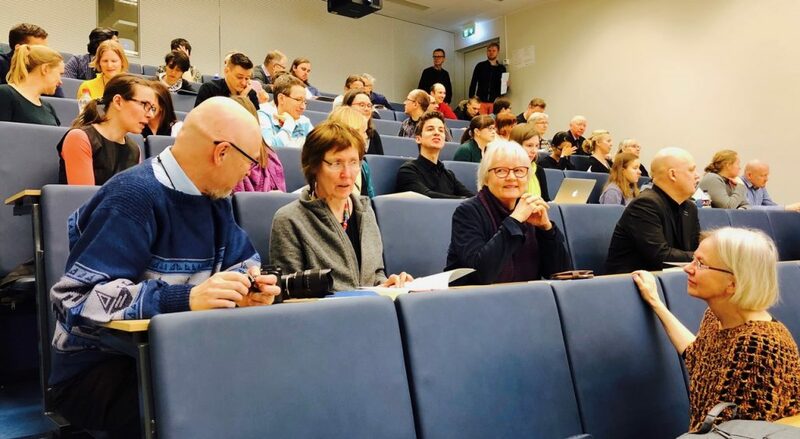 Image (from the left): Opponent Assistant Professor Laura Astolfi, Sapienza University of Rome, Italy; Custos professor Lauri Parkkonen, Aalto University School of Science, Department of Neuroscience and Biomedical Engineering; Kaisu Lankinen. In the excited audience the core innovators and developers of the brain imaging method of magnetoencephalography (MEG): Matti Hämäläinen (left) and my collaborators in neurocinematics, Riitta Hari and Elina Pihko (left). In early 1980’s, Riitta Hari pioneered the use of MEG to follow the spatiotemporal dynamics of brain activity, providing fundamental insights into auditory, somatosensory, visual, and pain and motor processing in healthy subjects and patient groups. In her thesis Kaisu Lankinen developed new data analysis methods for use of MEG in studying movie viewing processes in collaboration with her supervisor Miika Koskinen and others.